When I think of Christmas, holiday meals, I think of chicken: when I think of edible chicken parts, I think of chicken breasts: when I think of perfect chicken breast recipes, I think of Ruth’s Chris stuffed chicken breast. It is one of my favorite recipes at Ruth’s Chris restaurant, I get it almost every time I go there, and because I love it so much, I’m going to show you how to make a perfect Ruth’s Chris stuffed chicken recipe. You can thank me later. Stuffing or stuffed chicken comes in many different forms, shapes and varieties – there are so many it’s literally impossible to keep up with all of them. As the name suggests, this dish is made by stuffing the chicken. And by stuffing, I mean taking out what was in, and putting in your own stuff. Whole chicken, chicken bits, virtually anything can be stuffed. And although it’s a recipe usually popular during the holiday season, you can always cook it and eat it all year round. You might just be hearing of stuffed chicken, but it’s nothing new. It’s an old method of cooking that just sorta fills the void in a chicken, giving this whole fullness to the taste. A bonus, if you ask me. This chicken preparation by stuffing method was mentioned in an old Roman cookbook Apicius’ De Re Coquinaria wayyy back in the Middle Ages. They used a variety of herbs, nuts and vegetables in their stuffing. So the Romans invented the stuffed chicken? I don’t know, but thanks to whoever is responsible. Okay, enough history. Back to Ruth’s Chris restaurant dish. 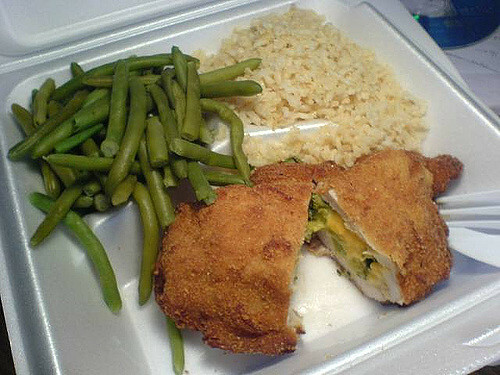 In many ways, this dish is so very different from normal stuffed chicken breasts. You’re probably wondering how…why. What Differenciates This Recipe From All the other Recipes? 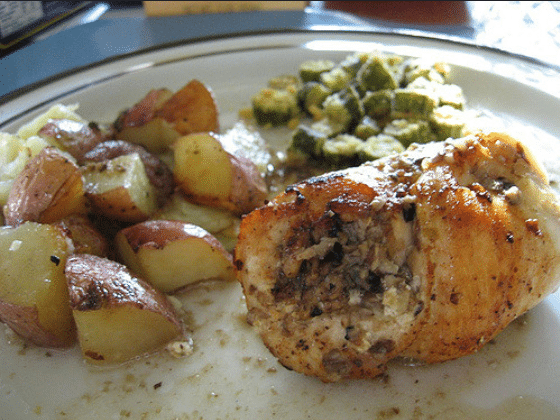 As I’ve said before, there are many varieties of stuffed chicken breast recipes. There’s the spinach stuffed chicken breast; basil, quinoa, feta stuffed chicken breast; sausage and provolone stuffed chicken breast and the herb and goat cheese stuffed chicken breast, to name a few. 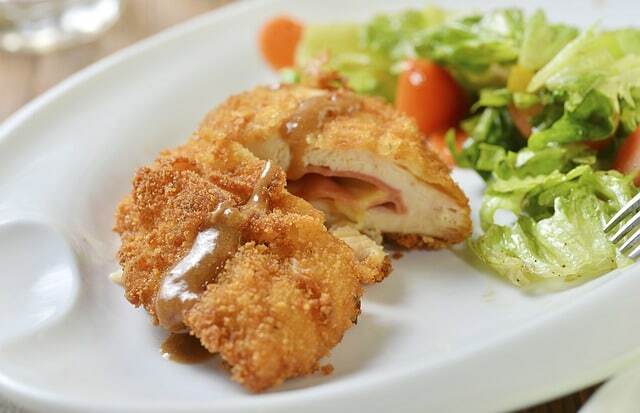 The main idea in a stuffed chicken recipe is to use vegetables, meat, bread and/or herb mixed in sauce and cheese. So yeah, technically, you can invent your own recipe. 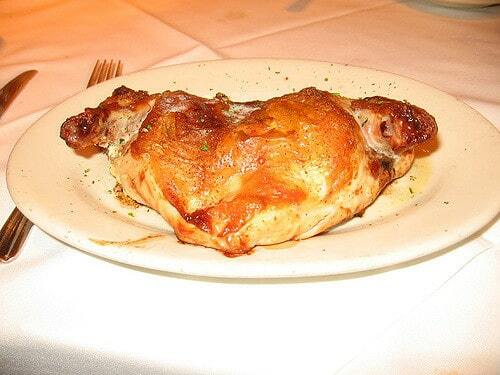 But Ruth’s Chris stuffed chicken breast is unique because of its ingredients – and the reputation of the restaurant. The recipe uses garlic, herb, cream cheese, ranch dressing and a great bit of imagination to bring out the flavour in the chicken. I especially love the garlic because it tastes really amazing in any dish and is quite healthy too. The ranch dressing is not a popular of mine but it works super amazing in this dish. Don’t tell anyone, but I think that’s Ruth’s Chris secret ingredient. Your tummy should be rumbling seriously right about now, so let’s quit the talk and get cooking. So what we’re making is a garlic herb cream cheese stuffed chicken. Yum yum. Please note that all the herbs are to be dry grounded. First, we prepare the stuffing. In a clean bowl, mix in your cream cheese, your sharp shredded cheddar cheese, ranch dressing powder and thyme. The ranch dressing has both garlic and salt, so just add some black pepper. Mix these well with a fork or food processor if you have one. Quick tip: let your cream cheese sit at room temperature for a little bit so it can soften up and then it’ll be easy to mix. Now we prepare the chicken. We’re gonna use double breasted chicken breast with the skin on, same as Ruth’s Chris does but if you don’t have one just use what you have. Just make sure that the chicken is thick so the stuffing doesn’t spill out. Cut out a pocket on the horizontal side of the chicken breast. Use the tip of your knife and cut out an opening deep enough to fill stuff in. You can use your fingertip to feel around. Now just stuff your garlic herb cream cheese filling into the pocket you’ve cut. Use your fingers to spread it in eventually. Line the baking sheet with foil and rub some olive oil or canola oil on it to prevent sticking. Stick toothpicks all the way through the stuffed opening to prevent it from opening up. Now we season the outside of the chicken. Sprinkle some garlic powder, salt, black pepper and parsley on the chicken, turn over and repeat on the other side. Drop a pad of lemon butter on each chicken breast, on the skin, and slide into the oven with the skin side up. Cook for about 20-30 minutes until it is brown. Your kitchen should be smelling like Ruth’s Chris when they bring you your meal right about now. Stuffed chicken breasts can be eaten as it is, but that’s just boring so it’s preferable to combine with some delicious sides or salads. 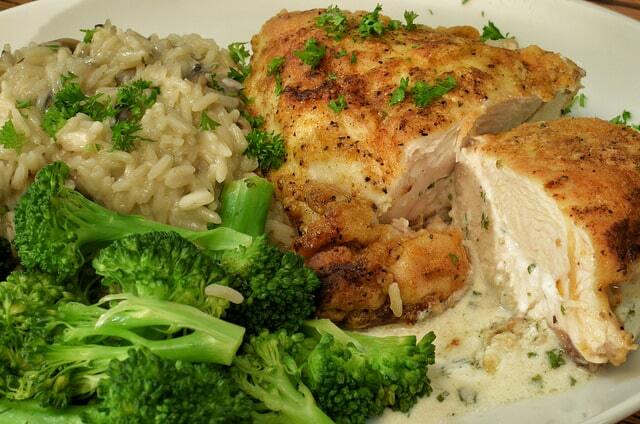 Ruth’s Chris serves their stuffed chicken breasts as an entrée with a wide array of sides for you to choose from. If you wanna go the entrée style and have that full Ruth’s Chris experience, you could use some of the sides I’ve listed here. Ruth’s Chris serves more than these, but I’ve picked out the ones I feel would go well with the stuffed chicken. Because the chicken is creamy, adding something creamy or starchy like rice or mashed potatoes to it would be too heavy. Brussels sprouts roasted with honey butter and tossed with crispy bits of bacon. Any non-cream based salad of your choice. So pair your stuffed chicken breast with any side of your choice and a glass of Zinfandel or Chard (I hear it’s really good with stuffed chicken) to go with it and enjoy the taste. If you won’t be using your stuffed chicken breasts as an entrée, here are some alternative ideas for it. As an appetizer. You could slice the chicken breasts up and make a nice tomato, coriander and mint dipping sauce to munch on while you await your entrée. As a snack. You could make even smaller cuts and serve as a finger food or a snack that you could just pick up and throw into your mouth. 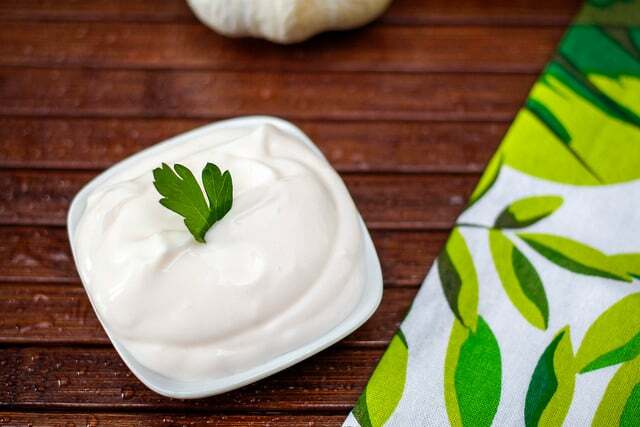 During one of my many wanderings, I came across this recipe for garlic herb cream cheese filling. I was actually confused for a minute and thought this was the Ruth’s Chris recipe. I later found out that it isn’t, but this recipe is great and actually kind of, in a weird way, tastes like Ruth’s Chris stuffed chicken breasts recipe. Kind of. In a way. Anyway, if you’re feeling adventurous, you can try this recipe out as well and compare with the Ruth’s Chris recipe and see if there’s so much difference. So here it goes. First, we prepare the filling. In a clean bowl, mix in your cream cheese, your grated Parmesan cheese, a little butter, garlic, oregano, parsley, thyme and basil. Don’t forget to add black pepper and salt. Mix these well with a fork or food processor if you have one. Quick tip: let your cream cheese sit at room temperature for a little bit so it can soften up and then it’ll be easy to mix. Please note that from here on out, it’s the same method as the Ruth’s Chris recipe listed above. Now we prepare the chicken. You can use double breasted chicken breast with the skin on, same as Ruth’s Chris does but if you don’t have one just use what you have. Just make sure that the chicken is thick so the stuffing doesn’t spill out. Cut out a pocket on the horizontal side of the chicken breast. Use the tip of your knife and cut out an opening deep enough to fill stuff in. You can use your fingertip to feel around. Drop a little butter on each chicken breast, on the skin, and slide into the oven with the skin side up. Cook for about 20-30 minutes until it is brown. And we’re done! Wow! This dish turned out to be more versatile and amazing than you thought huh? Well…that’s the Ruth’s Chris package for you. I sure hope you can reproduce this amazing Ruth’s Chris stuffed chicken recipe, and that you enjoy it as much as I did. See you later!